Opioid Abusers Turn To Imodium, A Risky Option : Shots - Health News An increasing number of opioid abusers are taking huge doses of Imodium to ease withdrawal symptoms or get high. But at those high doses, toxicologists warn, the normally safe drug can stop the heart. 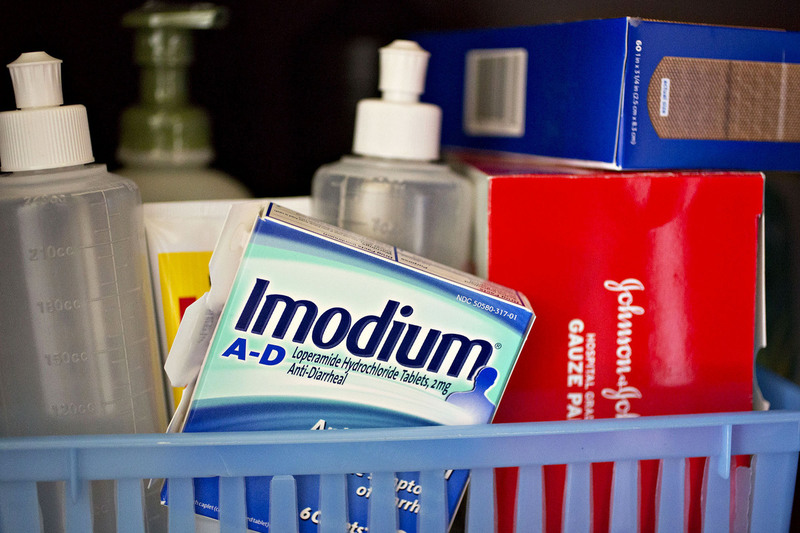 Imodium is a popular brand of the drug loperamide. Because loperamide is increasingly being abused by opioid users, some toxicologists think it should have the same sales restrictions as pseudoephedrine. Some people addicted to oxycodone and other opioids are now turning to widely available diarrhea medications to manage their withdrawal symptoms or get high. The results can be dangerous to the heart — and sometimes fatal — warn toxicologists in a study recently published online in the Annals of Emergency Medicine. The researchers describe two case studies where people who were addicted to opioids tried to ease their withdrawal symptoms by taking many times the recommended dose of loperamide, a drug commonly used to treat diarrhea. Both patients died. "Because of its low cost, ease of accessibility and legal status, it's a drug that is very, very ripe for abuse," says lead author William Eggleston, a doctor of pharmacy and fellow in clinical toxicology at the Upstate New York Poison Center, which is affiliated with SUNY Upstate Medical University. Loperamide — also sold under the brand name Imodium — can be purchased without a prescription as a liquid or pills; it activates some of the same receptors as other opioids, but at the dose that's recommended to treat diarrhea it doesn't produce feelings of euphoria. At doses 10 or more times higher than that recommendation, the drug can help ease symptoms of withdrawal from opioids, Eggleston says. And at the largest doses, it can generate a high similar to that of widely abused opioid pills or heroin. But at these very high doses, loperamide may be even more dangerous than its more widely abused brethren. Opioids generally suppress breathing, but loperamide can also fatally disrupt the heart's rhythm. "At the Upstate New York Poison Center, we have had a sevenfold increase in calls related to loperamide use and misuse over the last four years," Eggleston tells Shots. Imodium's manufacturer, Johnson & Johnson, did not immediately respond to a request for comment. The medication is also widely sold under generic labels. Eggleston says both patients featured in his case studies were using the drug to manage withdrawal symptoms from addiction to opioids. He says he doesn't know whether they were trying to get off the drugs for good, or were just using loperamide to ease symptoms until they could get their next fix. Recreational drug users frequently discuss how to use loperamide to manage withdrawal on several online forums. Eggleston and his co-authors believe sales of loperamide should be restricted in the same way as pseudoephedrine — available without a prescription, but only in limited doses, and dispensed by pharmacies.